Jimmy Garoppolo has been turning heads. He was the MVP of the East – West Shrine Game and has been invited to the Senior Bowl. 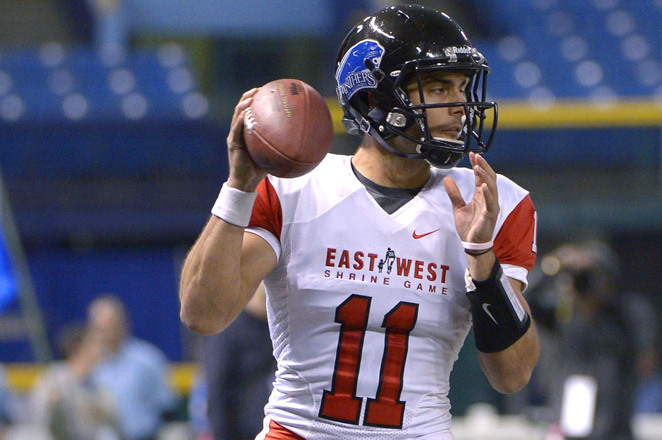 Jimmy Garappolo-QB-Eastern Illinois (6-2 219 lbs. ): Prolific senior season at FCS level competition. Quick release. Compact delivery. Good touch. Throws a nice back shoulder ball. Small hands. Had an impressive game. Game MVP and has been invited to the Senior Bowl. Led his team in passing, completing 9 of 14 for 100 yards and 1 TD. Jordan Lynch-QB-Northern Illinois (6-0 216 lbs. ): Two year starter that led North Illinois to a 24-3 record and two bowls, one of them a BCS bowl. Very tough runner. Maybe a better runner than passer. Seemed to be pressing. Only completed 2 of 7 passes for 3 yards and had 2 interceptions. Had 14 rushing yards on 3 carries. Jeff Mathews-QB-Cornell (6-4 229 lbs. ): Developmental guy due to the competition he has faced in the Ivy League. Good tools. Eludes the rush well. Good pocket presence. Sometimes puts too much air under the ball. Completed 4 of 5 for 37 yards and 1 interception. Rajion Neal-RB-Tennessee (5-10 212 lbs. ): Very good versatility. Good size. Good feet. Former WR that can be an asset in the passing game. Good jump cut. Able to return kicks. LaDarius Perkins-RB-Mississippi State (5-10 190 lbs. ): Versatile. Makes quick moves in the hole. Good receiver and able to return kicks. Had 4 carries for 21 yards and 2 receptions for 17 yards. Had a 35 yard kick return. Zach Bauman-RB-Northern Arizona (5-10 200 lbs. ): Workhorse. Quick feet and makes good cuts. Finishes runs well. Makes nice moves in traffic. Good change of direction skills. Led his team with 47 rushing yards on 8 carries. Matt Hazel-WR-Coastal Carolina (6-1 196 lbs. ): Lacks elite speed, but runs very smooth routes. Catches the ball really well. Runs with a long stride. Had a 1 yard TD catch. Jeremy Gallon-WR-Michigan (5-8, 187 lbs. ): Small and quick. Ideal size for a slot receiver at the next level. Good on screens. Has great elevation and can climb the ladder, despite his small size. Plays bigger than he is. Able to return kicks. Led his team with 4 catches for 55 yards. Erik Lora-WR-Eastern Illinois (5-11 190 lbs. ): Runs well after the catch. Able to beat press coverage. Kick return ability. Matt Hall-OT-Belhaven (6-10 320 lbs. ): Big long frame. Good movement skills for a player his size. Able to get down field on screens. Ethan Westbrooks-DE-West Texas A&M (6-4 263 lbs. ): Stood out as a very active player. Very quick off the snap. Has good burst and closing speed. Very good speed rush. Had 2 sacks and forced fumble. Will Clarke-DE-West Virginia (6-7 273 lbs. ): Has the long body type that 3-4 teams love for defensive ends. Good pass rush skills. Had a sack. Jason Bromley-DT-Syracuse (6-4 293 lbs. ): Prototypical 3 technique. Gets up field and creates havoc. Pursues well. Had a 4th down stop to force a turnover on downs. Bruce Gaston-DT-Purdue (6-2 305 lbs. ): Has the body type to play nose tackle. Ties up the middle of the line. Johnny Millard-LB-Cal Poly (6-3 240 lbs. ): NFL bloodlines, son of former Packers defensive lineman Keith Millard. Good instincts. Active and always around the ball. Andrew Jackson-LB-Western Kentucky (6-1 257 lbs. ): Big run stuffer. Has good inside-out pursuit. Ricardo Allen-CB-Purdue (5-9 186 lbs. ): Not very big, but not afraid to tackle. Looked very good as a returner. Had punt returns of 16 and 30 yards. Nevin Lawson-CB-Utah State (5’10 186 lbs. ): Very physical. Had a pass breakup in the red zone. Scored on 5 yard fumble recovery return. Phillip Gaines-CB-Rice (6-1 185 lbs. ): Good size. Competes for the ball. Called for pass interference. Ross Cockrell-CB-Duke (6-0 190 lbs. ): Good press corner. Good ball skills. Tackles well. Had a highlight reel one-handed interception. Pierre Desir-CB-Lindenwood (6-2 206 lbs. ): Has good size. Extremely raw. Active. Needs work on his footwork. Good special teamer that threw a key block on the 30 yard punt return. Andre Hal-CB-Vanderbilt (6-0 185 lbs. ): Good ball skills and make up speed. A.J. Marshall-S-Wake Forest (6-0 190 lbs. ): Reads and reacts well. Good concentration. Had a pick off of a tipped ball in the red zone. Hakeem Smith-S-Louisville (6-2 188 lbs. ): Physical player that can play in the box or deep. Called for a pass interference penalty. Tre Boston-S-North Carolina (6-1 190 lbs. ): Good in the box. Takes on blockers and makes plays. Jemea Thomas-S-Georgia Tech (5-10 195 lbs. ): Had a forced fumble that was returned for a touchdown. Keith Wenning-QB-Ball State (6-3 220 lbs. ): Pocket passer. Deceiving runner. Good accuracy. Has good zip on the ball. Limits turnovers. Throws a nice deep ball. Needs some work on his footwork. Led his team, completing 12 of 19 for 82 yards and had 1 INT. Had a fumble. Tommy Rees-QB-Notre Dame (6-1 215 lbs. ): Doesn’t have great size or arm strength. Son of a coach and has very good football IQ. Good accuracy on short to intermediate passes. Completed 5 of 11 for 69 yards and 1 interception. Keith Price-QB-Washington (6-1 202 lbs. ): Does have great size, but extremely athletic. Big arm. Throws well rolling to his left or his right. Nimble runner that eludes the pass rush well. Able to feel the pass rush and move around in the pocket to buy time. Has a great attitude, good leadership qualities and an infectious smile. Completed 2 of 6 for 28 yards and 1 TD. Ran twice for 18 yards. Timothy Flanders-RB-Sam Houston State (5-9 210 lbs. ): Two time Southland Conference Player of the Year. Fun to watch. Great moves that sometimes remind you of Barry Sanders. Very good outlet receiver. Dangerous in space and is able to spin out of tackles. Played some fullback, but looked out of place. Only had 3 carries, but gained 18 yards. Had 1 catch for 8 yards. Brennan Clay-RB-Oklahoma (5-11 198 lbs. ): Small and quick. Makes good moves in the hole. Had 3 carries for 5 yards and 1 reception for 3 yards. Ben Malena-RB-Texas A&M (5-9 195 lbs. ): Good hands. Quick feet. Good burst. Led his team with 23 yards on 10 carries. Had 1 catch for 3 yards. Had a 25 yard run negated by a penalty. Chandler Jones-WR-San Jose State (5-11 175 lbs. ): Small and quick. Does a good job coming back to the ball. Good footwork. Has the speed to separate. Led his team with 7 catches for 73 yards. Had a catch to convert a 4th down. Bernard Reedy-WR-Toledo (5-9 175 lbs. ): Small and fast. Fearless. Willing to take on defenders. Great returner. Works well with QB on scramble drills. Despite his size, is able to catch the ball at its highest point. Had 4 catches for 46 yards and had a 20 yard TD. Dropped a TD pass. Seantavius Jones-WR-Valdosta State (6-3 200 lbs. ): Very raw. Good size and speed. Had 1 catch for -1 yard. Dropped a TD pass. Ted Bolser-TE-Indiana (6-6 255 lbs. ): Reliable receiver. Good blocker. Loves to play special teams. Had 2 catches for 8 yards. Jordan Najvar-TE-Baylor (6-6 255 lbs. ): Had a good week. Good combination of size and speed. Seldom used as a receiver at Baylor, but showed a good skill set this week. Laid out to catch a 31 yard pass. Gabe Ikard-C-Oklahoma (6-3 290 lbs. ): A bit undersized for a center, but has good movement skills. Able to get to the second level and block linebackers. Good fit for zone scheme. Larry Webster-DE-Bloomsburg (6-7 250 lbs. ): Long, lean body type. Knows how to play with leverage. Good bull rush. Former basketball player. Had a sack. Beau Allen-DT-Wisconsin (6-3 333 lbs. ): Massive. Would be a good nose tackle. Had a sack. Max Bullough-ILB-Michigan State (6-3 265 lbs. ): Prototypical tough, hard-nosed middle linebacker. Was suspended for the Rose Bowl and gained 20 lbs. Plays with good leverage. Able to stone blockers and still make the play. Downhill run stuffer that may not have the foot speed to play on 3rd down. Shaquille Richardson-CB-Arizona (6-1 188 lbs. ): Breaks on the ball very wall. Had an interception. Carrington Byndom-CB-Texas (6-0 180 lbs. ): Fills quickly in run support. Had a tackle for loss. Struggled in pass coverage. Called for a pass interference penalty in the end zone. Gave up a touchdown by giving up inside position to the receiver. Alden Darby-S-Arizona State (5-11 195 lbs. ): Ball hawk. Maintains good position in pass coverage. Does a good job reading the quarterback’s eyes. Had an interception in the red zone. This entry was posted on January 25, 2014 by draftmaniacs in Uncategorized and tagged 2014 NFL draft, East - West Shrine Game, Jimmy Garoppolo, NFL, NFL Draft.